Christian children’s books about the biblical story of Easter or the animals we culturally associate with the celebration today (bunnies, chicks, etc.) are plentiful. But books which are true to the original message of Christ’s resurrection and also communicate a message of genuine concern for animals are hard to find. Because of this, The Story of the Easter Robin is worth noting, even if it might not be a completely ideal read for parents or caretakers who want to share both values with their children. 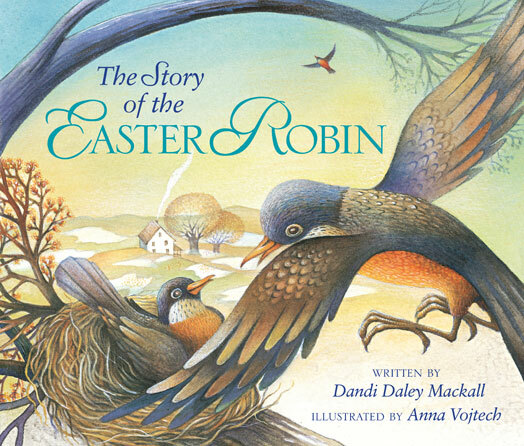 Gently written by Dandi Daley Mackall and warmly illustrated by Anna Vojtech, The Story of the Easter Robin is a classy and attractive book, and set in a context which values intergenerational family (through the main characters of a grandmother and granddaughter) and interaction with the natural world. My wife, a childhood educator, suggests it would be an appropriate story to read with second graders and older, though you might be able to share it with children a year or two younger with explanation of some of the more difficult words and concepts. Vegan and otherwise compassionate consumer parents might be concerned about the activity of coloring eggs which is featured in The Story of the Easter Robin. Though this might present an opportunity to suggest that we can decorate artificial eggs just as well, perhaps made of wood or plastic, and to note how doing so demonstrates a concern for the chickens as well as the robins which God created. The story communicates a commendable understanding of God’s concern and care for even humble domestic birds like the robin (a truth which has been integral to my own advocacy on behalf of animals as a Christian), in addition to the generally healthy principle of not interfering with wild animals. Still, it might be worth explaining to older children that there might be instances when it is appropriate to ask an adult to help a vulnerable wild animal, and also that while God doesn’t allow even one sparrow to fall without His knowledge or care (as taught in Matthew 10:29 and Luke 12:6), sadly some animals do suffer and all eventually die even so. The story’s subplot of how the Robin obtained his red breast, from trying to pull off Christ’s crown of thorns prior to death, is acknowledged to be drawn from Pennsylvania Dutch legend. It’s a noble and compassionate legend, though not found in the biblical story or in avian biology. But it does complement the core message and strength of The Story of the Easter Robin, which points back to both the cause and hope of Easter: Christ’s victory over death, which is so essential to the Christian tradition and faith. It’s a triumph which Scripture tells us will someway, somehow include God’s animal creatures as well, even the robin. And this is a hope which is worth making explicit to children after reading this noteworthy book together.